Monday Morning Drum Major will put a brief spotlight on the personalities in the drum corps universe. We'll run it each Monday (obviously). 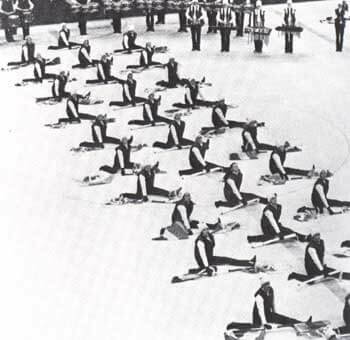 If you have an item worthy enough for mention on Monday Morning Drum Major, e-mail it to dave@dci.org Remembering the 27th Lancers at the Olympics We were reminded of the historic 27th Lancers performance at the 1980 winter Olympics in Lake Placid, N.Y., while watching Friday's winter Olympics opening ceremonies. In the 1980 DCI program book, Lancers director George Bonfiglio noted, "It was a great thrill for the kids." Bonfiglio continued, "The biggest thrill for the kids happened while we were rehearsing for the closing ceremonies, and all the athletes were in the stands waiting for their turn to rehearse. The Lancers received a standing ovation from the athletes," Bonfiglio noted then. The week in Lake Placid was tough on the 27th Lancers, according to the program book. The corps practiced in zero-degree temperatures, frozen bugle valves were treated with antifreeze and drum heads and sticks cracked at an alarming rate due to the weather. The corps ended that historic week in New York with a rendition of "Danny Boy" -- on ice! The skating expert: Michael Boo An important DCI footnote to the 2006 Torino winter Olympics: DCI.org's Michael Boo penned a book all about figure skating back in 1998! Boo's book, which features an armchair guide to skating terminology, great action photos and a comprehensive history of the sport, is called "The Story of Figure Skating." It's available HERE. From VK to CHiPs to N.O. Robert Martinez, a Velvet Knights bass drum alum (1992-1994), found himself on disaster double duty this past fall when he was deployed to Louisiana (he's in the California Highway Patrol) initially to help clean up after hurricane Katrina. Mother Nature had other plans, and Martinez stayed to help out with a second hurricane. "I went to help with Katrina but stayed for Rita," Martinez said. Martinez's division paired up with Louisiana State Police officers and patrolled New Orleans, which "Looked like something out of the "Terminator" movies after a nuclear blast," Martinez said. Martinez noted long days on the job. "We worked an average of 16-hour days. Luckily, I had my Ipod with a lot of DCI recordings that helped me get through the time away from home." Martinez notes that his years in the Velvet Knights uniquely prepared him for his work as a California policeman. "My experience in drum corps has helped me in my years after drum corps. It had helped me get onto special details on work. I often use it as a metaphor when describing team work and achievement. A lot of people I work with bring up their stories about being in the military or sports, to which I quickly respond with a drum corps story of my own. When I tell one of my many tales of tour at work, the guys start laughing. If you can make it through tour, you can make it through anything," Martinez said. We'd laugh if we heard stories about a giant shark devouring a fat dude in drag on a football field too, Robert! Do you have an item worthy enough for mention on Monday Morning Drum Major? E-mail it to dave@dci.org .